In 2014, Janice Bagarose of Locust Avenue in Troy found a wonderful collection of photographs from the World War I era in her new home. Thankfully for historians everywhere, she donated them to the RCHS. The photos were collected by Mary T. Ryan, who was the City Historian of Troy in 1922 and 1923. They were taken by Bert Boice, who was one of the most important local photographers for decades. The images show many events which took place in the city during the war- from the send-off parade for the local regiment in August 1917 to the memorial service for the fallen in September 1919, plus local activities of the Red Cross and other service organizations during the war. The collection not only shows us the activities in the city during the war, but also shows us the people and buildings of the city at the time, and gives us insight into clothing, transportation, streetscapes, shopping, etc. The two photos in this post mark the local beginning and end of World War I. The first (2014.24.55c) is a photo of the send-off parade for the 105th Infantry Regiment on August 24, 1917. This was the 2nd NY Infantry Regiment, part of the New York National Guard, which was nationalized and activated soon after the U.S. declared war on Germany in April 1917, and renumbered the 105th as part of the 27th Division. The Division trained at Camp Wadsworth, near Spartansburg, South Carolina from September 1917 to May 1918, when it deployed to France. The city of Troy hastily organized a send-off at the end of August, 1917, with a parade, pictured above, and a bit of entertainment for the men, just before they left. The photo was probably taken from the window of the photographer’s studio at the south end Franklin Square, looking north to the junction of 4th and River Streets. The building in the distance is now the home of King Blinds, the other buildings are gone, the streets slightly realigned due to the approach to the Green Island Bridge. Undoubtedly the men in uniform on the very tall extension ladder were fireman from the Trojan Hook and Ladder Company, which was located just out of camera range on the right. The 27th Division participated in a couple of smaller battles in Belgium and France in early summer. On September 29 and 30, 1918, as part of the 4th Army, it was heavily involved in the action which pierced the Hindenburg Line, as the major German defenses were called, between Cambrai and St. Quentin, France. A great mural in the NYS Military Museum in Saratoga depicts this battle. The Division fought in an even larger engagement from October 11-20 at the LaSelle River. At that point, having incurred about 2,300 casualties, the Division was withdrawn from action. Less than a month later, the Armistice was signed on November 11, bringing most fighting in the War to End All Wars to an end. As it took many months to deploy the soldiers of the American Expeditionary Force to France, it took just as long to send them home. The 105th arrived in New York in March 1919, and was greeted by another parade in Troy in April. Men from Troy served in many regiments, and in the Navy as well as the Army. 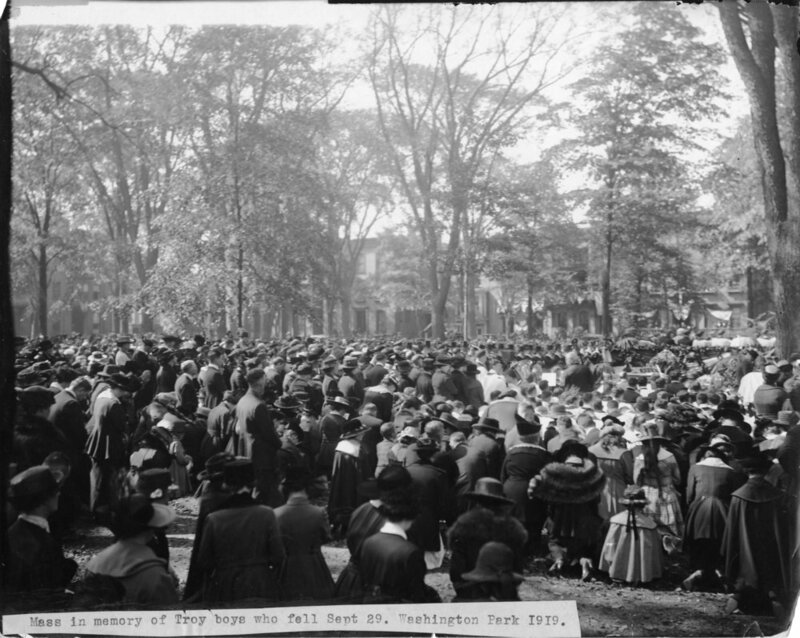 The second photo (2014.24.4) above, depicts a memorial mass for those killed in the war, held in Washington Park on September 29, 1919, by which point all soldiers were home. About 225 Trojan soldiers died during the war. The photo looks to the south and west, with Washington Place and Second Street in the background. Presumably, the crowd was too large to fit into St. Mary’s Catholic Church. This beautiful picture shows a well-dressed crowd at prayer, with many priests in attendance. Washington Park was and is a private park, accessible only to those who live around it. St. Mary’s location on Third Street on the southeast corner of the park would qualify its use for the mass. The rest of the collection features photos of the same high quality. It is a great addition to the archive. These and other resources related to Rensselaer County’s World War I history are available for research during regular library hours on Friday and Saturday from noon to five, Thursday from noon to eight (except on holidays and in January), or by appointment.